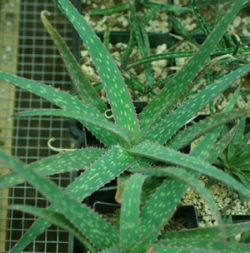 Note: Due to popular demand we are making available some of our larger Aloe arborescens plants. They are for all practical purposes exactly as pictured, grown in gallon pots, 5-year-olds, will be depotted to ship. Hardiness: Zone 8 to 10, often grown as a potted plant indoors or on the summer patio. 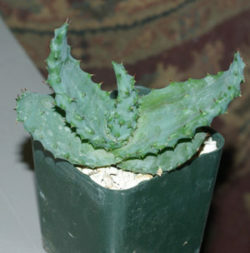 (Krantz Aloe) Perennial succulent native to South Africa. Growing up to 8 feet tall, the plant flowers coral-red in the fall and/or winter. Plants produce one or more upright stalks with the showy rosettes perched on top, leaves rimmed by large, soft and harmless spines, filled with gel. 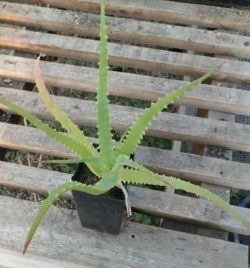 Aloe arborescens is an excellent choice for potted culture anywhere, or outdoors culture in maritime California, desert areas and the South. When left in potted culture, keep indoors in a bright window, in the shady greenhouse or on the porch in the summer, then bring in for the winter. 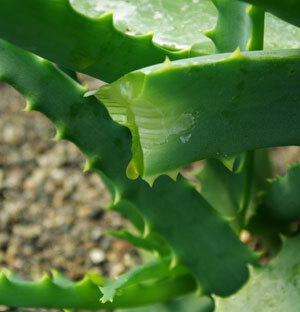 Drought tolerant, but also, among the Aloes we’ve grown, more tolerant of cold and “wet feet” than most. “Krantz” is the Afrikaner word meaning “cliff” or “rocky ledge,” referring to the natural habitat. Plant prefers dry to mesic soil and full sun to part shade. Space plants 2 to 3 feet apart–they soar!